Christmas is over, and I'm thinking already about the new year and a clean slate. Every year I go through this same cycle with Christmas bringing excess in decorations, in coziness, in food and traditions but immediately once it's over I want to purge obsessively. The tree is gone, decor packed up and stored away and I usually fill a few bags of old toys from the kids for donations. At this time of year I'm ready for new ideas, new projects and a new space. While I've mentioned briefly our plan to move soon that might still not happen until late next year but of course that doesn't keep me from thinking about and planning spaces in our next home! In our current house we've renovated the kitchen, floors in 85% of the house, changed lighting and commissioned some custom storage, gave the laundry room and update and even did some minor renovations to the guest bathroom (kid's bathroom). After all this the bathroom in my room is still untouched, and like most things about this house in their original state, it doesn't reflect my style. 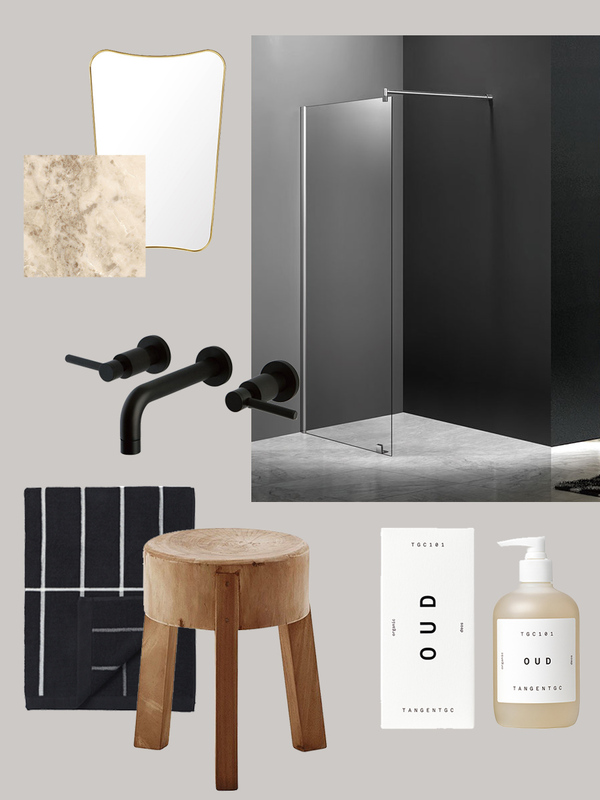 So I've partnered with Decoraport to dream, scheme and bring you a few ideas about creating a bathroom that begins with choosing a shower stall. As I mentioned, in its current state my own bathroom is not ideal but I do love very minimal design in this room of the house. For us the bathroom is usually in this mad state, where one minute the counters are covered in hair dryers, lotions and beauty products and the next minute everything is quickly tucked away again. This is why simple, clean, and easy to maintain are all incredibly valuable in a bathroom. For me, beginning with a simple frameless glass stall like this one is getting everything started on the right foot. With a frames glass stall, the walls and flooring can be the same material to create the look of one solid piece. The ultimate counterbalance to the chaos of getting ready. Once you have your shower in place the other elements can come together relatively easily. Choose other large features like the sink, a mirror (this one is from Gubi), flooring, lighting and hardware. A matte black faucet is a bit unusual and I like the contrast of beige versus white with the black. A slightly more subtle pairing. Some graphic textiles like rugs and towels go well if your walls and tiling are pattern-free. My dream bathroom would be covered in Tadelakt, which is this ancient Moroccan stucco like material that is durable and waterproof. Even though I like some tile, like the one I included in the collage above, a material that can be swiped over the whole room and leave everything seamless is still preferable. From here you can move onto the smaller things, or the less permanent features. If you're furniture enough to have a lot of space in your bathroom you can add a free standing medicine cabinet or shelves. A small stool like this Roger stool offers a nice organic wood contrast to an otherwise sleek bathroom. Of course it's not only for looks though, drape clothes or stack towels on top, add a tray with candles or keep it near a tub for holding a book. A candle and some good soap are also essential for me. I splurge on good soaps and detergents form time to time because it's something I get to enjoy every day and it feels a bit like pampering. A candle needs to explanation, really they should be in every room of the house. *This post was created in part thanks to Decoraport, all words and suggestions are my own.